Dies ist eine schöne Wohnung mit einem Schlafzimmer in einem kleinen und privaten Komplex in der Nähe des Strandes und Annehmlichkeiten in Port de Soller, nur wenige Minuten vom Meer entfernt. Doppelzimmer mit Bad, kleine Küche, Wohnzimmer, kostenloses WLAN, Klimaanlage im Schlafzimmer, große, geräumige Terrasse mit Essbereich im Freien und Gartenstühle. Es hat auch Zugang zu einem kleinen wunderschönen Swimmingpool. Kostenlose Parkplätze vor dem Komplex. Besser kann ein Appartement von der Lage her nicht sein! Von der sehr grosszügigen Terrasse aus ein phantastischer Blick auf ganz Port de Sóller. Ebenso aus dem Wohn- und Schlafzimmer. Gutes Preis-Leistungsverhältnis. Amazing views. Good location for port restaurants and shops. I have travelled abroad to various countries and have never been "bitten" as badly before this holiday. The odd mosquito bite apart it is my personal opinion that the bed is infested with something quite nasty. I'm now having to consider going to see my GP to sort the skin mess out. Itch relief salve is not working. Something you need to be aware of. We stayed here last year and immediately booked it again. I wrote a comprehensive review last year so I'll just do an update. The terrace is what makes the apartment. The views are breathtaking and we spent hours sitting reading, drinking wine and listening to music in the comfy chairs or the new sun loungers. The walk up the hill certainly gets the heart pumping! A good tip is to go down to the main supermarket when you first get there then get a taxi back up as you would really struggle with walking up with water, wine etc. There isn't any air con so it gets pretty hot on a night. There are 2 big fans but it would be nice to be able to leave a window open but we got really bitten by insects so that was not possible. 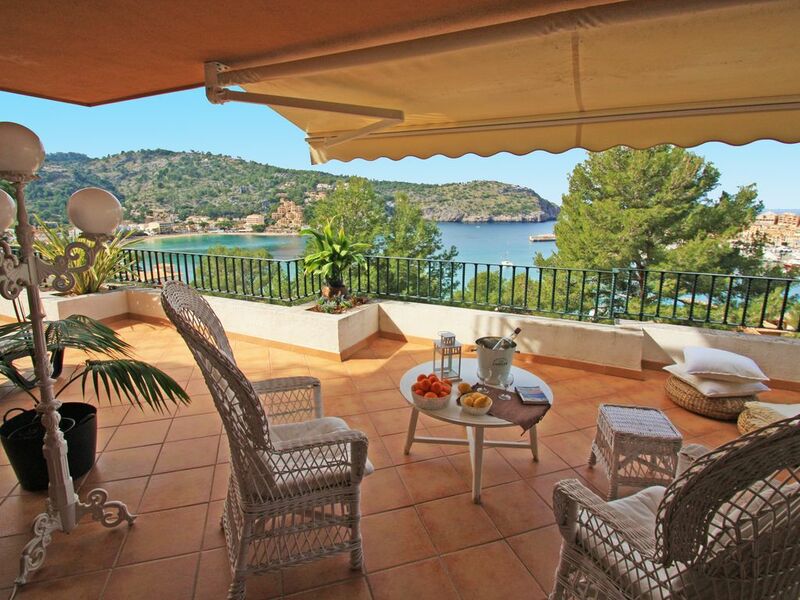 We have fallen in love with this part of Mallorca and this apartment gave us just what we needed - a week of total relaxation close to the lovely restaurants and amenities of Port de Soller. We stayed in the terrace apartment for a week in August. The accommodation was extremely spacious with a wonderful terrace and excellent views over the harbour, beaches and out to the sea. Th,e location was excellent, albeit up a hill, but to get the views that was expected. There were a couple of downsides though; at night the walk down the steps from the pool to the apartment was not lit and potentially dangerous, and there was no air conditioning in the apartment. There were fans, but these were so noisy you couldn't be in whilst they were on. I was also a bit disappointed in the 60 Euros standard cleaning bill added to the overall cost - we kept the place clean as we went along. Overall it was a good week, but it would have been better without these wrinkles.